It's the end of the night, but Megan and Trevor's life together is just beginning. Megan and I met each other while we were both working ... she at Lululemon and me DJing at the store she works at. You really never know when your next business opportunity is. A few months before this wedding, I was DJing at Megan’s work, the Lululemon store in La Jolla, CA. When I was done with my set, she came up to me and mentioned an engagement party she and her fiance, Trevor, were throwing. The kicker … this little engagement party would be turning into a full on wedding before the night was over. The timing could not have been more perfect as I just attended a party-turned-wedding the week before. So it was settled, Megan booked me and I had a great time helping plan the surprise, at least from the DJ’s perspective. The party, which took place at Paradise Point & Spa seemed pretty normal, with drinks, sushi and other food. Then a friend gathered everyone up and said a toast was about to occur, when in actuality it was their ceremony. The evening progressed from there and it was time for a wedding dance party. Megan and Trevor started their lives together by creating a great surprise memory for their family and friends. She is a big fan of 80s, especially rock, so you’ll see that prevalent throughout the night. Engagement party ... just kidding? This turned into a wedding before the night was over. 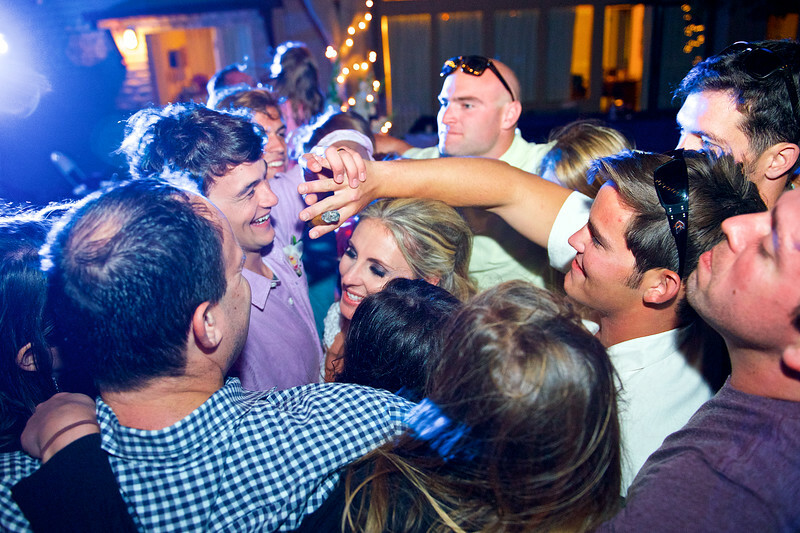 Megan and Trevor dance with friends and family at their Paradise Point wedding in San Diego. Every wedding should end with one last group hug.